Can we know anything about God apart from the Bible?Many Protestant Christians are suspicious of natural theology, which claims that we can learn about God through revelation outside the Bible. How can we know anything about God apart from Scripture? In Nature's Case for God, distinguished theologian John Frame argues that Christians are not forbidden from seeking to learn about God from his creation. In fact, the Bible itself shows this to be possible.In nine short and lucid chapters that include questions for discussion, Frame shows us what we can learn about God and how we relate to him from the world outside the Bible. If the heavens really do declare the glory of God, as the psalmist claims, it makes a huge difference for how we understand God and how we introduce him to those who don't yet know Christ. 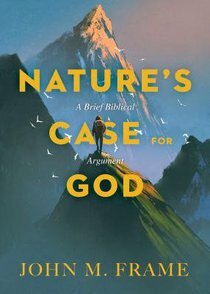 About "Nature's Case For God: A Brief Biblical Argument"
Dr. John M. Frame (M.A., M.Phil., Yale University) is Professor of Systematic Theology and Philosophy at Reformed Theological Seminary. An outstanding theologian, John Frame distinguished himself during 31 years on the faculty of Westminster Theological Seminary, and was a founding faculty member of WTS California. He is best known for his prolific writings including ten volumes, a contributor to many books and reference volumes, as well as scholarly articles and magazines. Rev. Frame is a talented musician and discerning media critic who is deeply committed to the work of ministry and training pastors. His select publications include Apologetics to the Glory of God (1994); Cornelius Van Til: An Analysis of his Thought (1995); Worship in Spirit and Truth (1996), and Contemporary Music: a Biblical Defense (1997), and his recent major works in the Theology of Lordship series The Doctrine of God; The Doctrine of the Knowledge of God; Doctrine of the Christian Life and The Doctrine of the Word of God.